On this superb outing, seven-string jazz guitarist Steve Herberman exhibits a vast harmonic palette involving uncommon stretches on the fretboard along with a real capacity to burn on fluent single note lines. Alternating between a deft fingerstyle approach on rich chordal melodies, a technique that allows for more contrapuntal voicings, and using a pick on accelerated single note runs, Herberman gets the best of both worlds on his instrument. Hearing his sheer command of the instrument on pieces like the burning bop-fueled “Cos’ Groove,” the darkly introspective “Negev Journey” and jaunty swingers like “Be Nimble” and “Sphericity” immediately puts one in mind of such jazz guitar masters as Joe Pass, Joe Diorio, Lenny Breau and Gene Bertoncini. His nuanced touch, excellent tone, tasteful, even phrasing and fresh writing style, particularly on delicate ballads like “Halcyon Air” and “Nearly Time,” the challenging intervallic vehicle “Snap!” or the angular boogaloo “Worry Not,” further elevates Herberman far above the pack of other talented Berklee grads now looking to find their place in the jazz world. The D.C.-based Herberman also excised good judgment in recruiting New Yorkers Drew Gress and Mark Ferber for his rhythm section on his project. Gress, a stalwart on New York’s downtown scene, is one reliable groovemeister and one of the most creative improvisers around. His tone is huge and his time feel on swingers like the up-tempo “Cos’ Groove” and mid-tempo numbers like “Shoutin’ Down” and “Sphericity” is solid and unerring. And his melodic solos on the bossa-flavored “Halcyon Air” and on “Nearly Time” contain rare beauty. Though highly regarded inside the alternative jazz circles, the largely underrated Ferber shows uncommon empathy throughout this session, along a relaxed, rhythmically assured sense of swing, as he aptly demonstrates on “Shoutin’ Down,” which features some hip exchanges between guitarist and drummer. 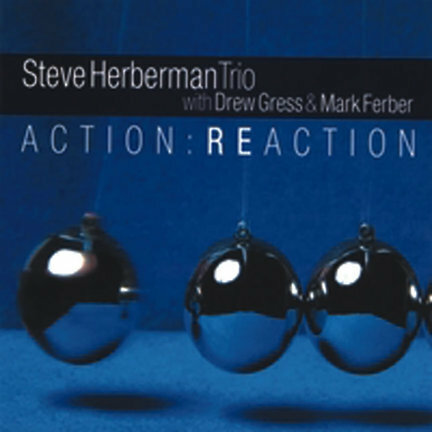 Herberman’s follow-up to 2001’s Thought Lines is definitely worth checking out for fans of advanced jazz guitar.